If you hang around Southwood for very long, you will no doubt hear about small groups. They have been a critical component of our vision for the church from the very beginning. In fact, you will hear more about them very soon as we approach our sign-up period, which we call Next Wave. So, as you consider becoming a part of one of these groups, maybe we should first ask the question, exactly what are small groups? The answer might be more involved than you might think. On one hand, the name is pretty self-descriptive. A small group is a small group, or a relatively small group, of people who intentionally gather together to journey in faith together. The Bible is clear in that all of the Christian life is about relationships. We cannot go on this journey of faith alone and hope to succeed. Our faith is expressed within the context of relationships, and we need relationships in order to stay on course. We are not enough in and of ourselves. Therefore, here at Southwood we strongly emphasize small groups and encourage folks to be in small groups because we do not see them as optional for maturing disciples of Jesus. On the other hand, all small groups do not look the same. They are formed with different purposes in mind. Southwood has a good variety of small groups. 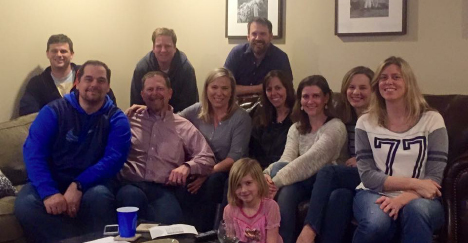 Our most visible small groups are those we refer to as “mixed,” containing both couples and singles. We have 15-20 of these groups meeting at various times, in people’s homes and here at the church. These groups can tend to be larger. There might be a lot of kids involved. The common thread among them is their ability to enable deeper relationships to be formed that cannot happen on Sunday mornings alone. Some groups do studies of some kind and some don’t, but their primary function is developing community among our church folks. In addition to these groups, we have quite a few smaller men’s groups and women’s groups. These groups are also great for developing depth in relationships, but that typically happens around deeper study. The women’s groups meet at the church on Thursday mornings and also one evening of the week. The men’s groups met last year on Wednesday and Thursday evenings. They are typically smaller than other groups, and they are more intense and more demanding in their participation. We also have some small groups among our men and women that formed because of similar needs for accountability and encouragement in their particular stage of life. We have a variety of small groups we call Ministry Teams/Committees that help lead critical aspects of the ministry here at Southwood. These teams gather together around particular tasks, such as finances or missions or even decorating. Finally, we have Southwood folks who are leading small groups with people outside of the Southwood community as an outreach. So, you can see, when we talk about small groups, we are speaking of a wide variety of gatherings of Southwood folks, who come together to serve, to learn, to know and be known, to encourage, and to spread the Kingdom. So, what type of group is the best fit for you? Do you need to develop deeper relationships within the church family? Do you want to grow deeper in your knowledge of God and the Christian life? Do you want a place to serve in an area where you are passionate and experienced? I would bet we have a group for you. Tell us what you are looking for, and we’ll see if we can find the right place for you.